Sure, it was leaked over a week early, but the Flip Slide HD is still quite a surprise in many ways. If you'd asked us to bet, we'd have put money on the next Flip camera including minor-but-important enhancements like image stabilization and perhaps a 1080p sensor with better low-light performance. After all, competitive products like the Kodak Zi8 and Sony Bloggie get great reviews for these simple incremental feature additions, and it's been nearly a year and a half since the original Flip Mino HD came out. But apparently you get to play by different rules when you own nearly 40 percent of the "shoot and share" camera market, and Flip's latest cam eschews the spec upgrade game in favor of repackaging the Mino HD into a radical new form factor with a tilt-slide screen that's designed as much for playback as it is for recording. It's an interesting take on sharing video, but we can't say it's worth it -- especially not for $279. Read on for our full review. Since the Slide HD is fundmentally just a remix of the Mino HD, we won't get too deep into the nitty-gritty here -- chances are you've seen enough Mino HD video floating around the web to know what you're getting into here. 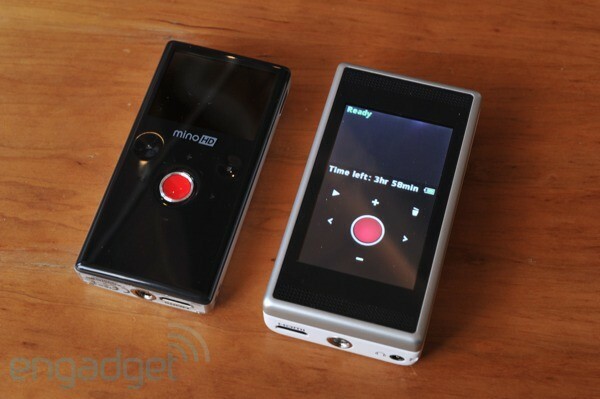 (If you haven't, there's some in our Mino HD premium hands-on.) What's really important with the Slide HD is the screen -- a three-inch resistive touchscreen that slides out and pops up at a 45-degree angle for easier viewing during playback. Flip says lots of customers never offload their videos, so the Slide HD is designed to function a both a camera and a portable theater. Note: We hadn't figured out how to pause when we made this video. See below. Unfortunately, optimizing the Slide HD for playback means that it's not nearly as optimized for recording video. The Slide is basically a really chunky Mino HD when in camera mode -- you get the same buttons and the same interface, just implemented via touchscreen. Unfortunately, there's simply no way the flimsy resistive touchscreen on the Slide can compete with the big red physical record button and capacitive menu buttons on the Mino; the Slide's interface isn't laggy, per se, but it's not as immediately and viscerally obvious what you're doing when you touch the screen as when you use a Mino's buttons, especially since anything less than a firm press doesn't register. Making matters worse, Cisco didn't optimize the recording UI for touch or make any other enhancements for it, leading to some stupendously bad user experiences. For example, you can't simply tap on "yes" to confirm deleting a video -- you have to tap the left arrow button twice and then tap the play button. What? Similarly, you can't turn the Slide on its side and record using the full area of the screen as a monitor -- you're stuck using the same tiny portion of the screen as the Mino. There's no tap-to-focus or tap-for-exposure, which would be amazing on a camera like this. Note to Cisco: simply adding a large touchscreen to a product isn't worth the size and weight penalty if you don't actually use it for anything good. Okay, so the record mode isn't great -- what about playback? That's the whole point, right? Well, yes -- the three-inch screen is bright and has decent enough viewing angles for multiple people to watch together, but the interface is equally confusing and half-implemented. For starters, we have no idea why navigation is duplicated across two sets of controls: not only can you tap on the sides of the screen to scroll between videos, you can use the odd capacitive slider on the bottom half of the case. Why can't you just swipe across the screen? Tapping either the screen or the touchstrip launches a video, and that's pretty much all you can do: there's no rewind or fast forward, and to pause or change the volume you long press on the playing video -- a move so unintuitive on a device like this we actually had to look at the manual. We're sure the target audience for this thing is going to love doing that. Oh, and you can't edit or delete videos in any way in the playback mode, although you can mark a video as a favorite in the browser by tapping a tiny little star. Pretty awesome playback experience, right? We'd much rather use the free FlipShare apps available for iPhone, Android, and BlackBerry to dump our Flip videos on our phones -- the screens and controls are much better, to put things lightly. Finally, there's the issue of the Slide's $279 pricetag. We're sure that number will come down over time, but let's be blunt: you can buy a much, much better camera for this kind of money. We're talking better lenses, better sensors, better video, and more features all around. For example, the Samsung TL225 runs about $250, offers a three-inch touchscreen and a front-facing LCD for self-portraits, shoots 720p video, and has image stabilization, face detection, and every other feature you can think of. The Nikon S8000 is $260 from Amazon right now and offers 720p recording at up to ISO 3200, a 10x optical zoom lens, and a three-inch, 921,000-dot LCD that will absolutely crush the screen on the Slide. The Canon PowerShot SD980IS is about $250 and -- look, you get the idea. $250 is a point-and-shoot sweet spot, and there's no shortage of cameras at this level that outgun the Slide HD in every possible way. It's one thing to spend $150 on a Mino HD and get a perfectly-executed and beautifully-made pocket video camera, but it's another thing entirely to spend nearly $300 and get chunkier version of the same thing that's outmatched by every HD-capable point-and-shoot on the market. That's the wrong kind of surprise -- maybe next time Cisco should shock us with functionality instead of gimmicks.